This article is about the city in Mexico. For other uses, see Torreon (disambiguation). 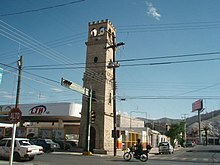 Torreón (Spanish pronunciation: [toreˈon] ( listen)) is a city and seat of Torreón Municipality in the Mexican state of Coahuila. As of 2015, the city's population was 679,288. The metropolitan population as of 2015 was 1,497,734, making it the ninth-biggest metropolitan area in the country and the largest metropolitan area in state of Coahuila, as well as one of Mexico's most important economic and industrial centers. The cities of Torreón, Gómez Palacio, Lerdo, Matamoros, Francisco I. Madero, San Pedro, Bermejillo, and Tlahualilo form the area of La Laguna or the Comarca Lagunera, a basin within the Chihuahuan Desert. During the Mexican Revolution, the city was taken more than once; the most prominent character ever to take the city was the revolutionary general Pancho Villa. It was also the location of the Torreón massacre, where 303 Chinese immigrants were killed by the revolutionaries over a ten-hour period. During the revolution, Torreon was also the site to an important convention which led to a deal between the insurrected armies. 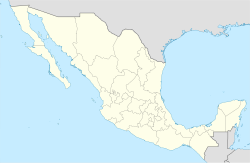 The city is 56 km (35 mi) southwest of historic San Pedro de las Colonias, where some of the Mexican Revolution fighting occurred. After the Mexican Revolution, the city continued to develop economically; during the first years of the 20th century the primary industry of the city was farming, although other industries later formed or were established in the area. On September 15, 2007, Torreón celebrated its first 100 years as a chartered city. It held a series of cultural events from September 15, 2006, to September 15, 2007, culminating on the day that the city turned 100 years old. 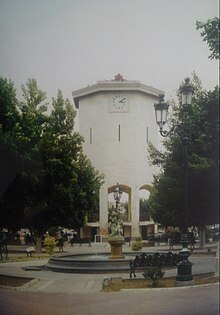 Torreón is near the southwest border of the state of Coahuila, within the Laguna region of the state. The border is delineated by the Nazas River that separates it from Gómez Palacio, Durango. The municipality covers 1,947.7 km2 (752.0 sq mi), including much of the rural area south of the city. The city's elevation is 1,120 m (3,670 ft), which is low for the Mexican interior. The terrain where the urban area is spread is generally flat, with somewhat prominent relief formations (up to 1,600 m (5,249 ft) south and southwest of the city, thus visible at well-nigh any given point in the city. Higher mountains, over 3,000 m (9,843 ft), are on the southern, mostly uninhabited section of the Municipality, the most prominent being El Picacho. The city features a desert climate (in the Köppen climate classification BWh). Rainfall is scarce but more prominent in the summer, whilst temperatures are very hot by day and cool at night, although the urban heat island effect causes temperatures on summer nights to be considerably warmer than nearby areas. Flora and fauna are those common to semidesert habitats. Cristo de las Noas, at 21.80 m (71.5 ft), is the third tallest statue of Christ in Latin America, only smaller than the statue of Christ The Redeemer in Brazil and Cristo de la Concordia in Cochabamba, Bolivia. Situated on the top of a hill, this image of Jesus with extended arms symbolises protection for the inhabitants of Torreon. The hilltop has a Catholic church and offers a view of the entire city. There are also several shopping centers in the city, including Galerias Laguna, Plaza Cuatro Caminos and Intermall. The "Canal de la Perla" (the Pearl Watercourse), an underground watercourse built in the 19th century to drive the Nazas' river water to the fields near the city, was re-discovered in 2003 and re-opened in 2014. It now passes under the oldest part of the city and it can be visited and walked through. It is also used for cultural and artistic exhibitions. In 2006, the "Museo Arocena" (Arocena Museum) that holds art collections from the pre-Hispanic times to the present, was opened; it also has a section dedicated to Mexico's and Torreón's history. There are also temporal expositions, conferences, book fairs, movies, and activities for children. The area was originally a center for ranching. With irrigation the city became an important center for support for farming and processing of cotton. In the middle of the 20th century, it became an industrial city. The city has industries in textiles, clothing and metals processing. Some important industries and companies that have business here, like Peñoles, an important Mexican mining group, and Motores John Deere, Lala, an important dairy products company, Yura Corporation, stores like Soriana, Cimaco, Extra, among others. 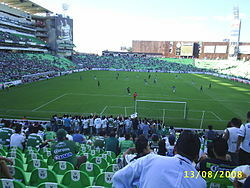 Torreón has a football team in the Liga MX, Santos Laguna. The team won championships in 1996, 2001, 2008, 2012, 2015, and 2018. It used to play in Estadio Corona, until 2009 when it moved to the Territorio Santos Modelo to meet the growing demands of its fan base. The city is also home to a baseball team called "Vaqueros Laguna" (Laguna Cowboys). Torreón's professional basketball team, Jefes de Fuerza Lagunera, play in the Municipal Auditorium, which seats approximately 3,000 people. They are members of the LNBP (Liga Nacional de Baloncesto Profesional) which is considered to be the top basketball league in Mexico. Former NFL placekicker and Super Bowl XXI champion, Raul Allegre, is a Torreón native. The main annual festival in Torreón is the Cotton and Grape Fair (Feria del Algodón y La Uva) which takes place in September. It contains cultural events, music, food and amusement rides. It takes place on September 15 and 16. There are celebrations all around the city, but the most important is the one celebrated in the Plaza Mayor. People wear traditional Mexican clothes, eat traditional dishes and "Antojitos". At night the city mayor makes the traditional celebration of "El Grito". The next day (September 16) there is a parade on the Morelos Avenue. ^ a b c d "Número de habitantes. Coahuila de Zaragoza". www.cuentame.inegi.org.mx. ^ "NORMALES CLIMATOLÓGICAS 1951–2010" (in Spanish). Servicio Meteorológico Nacional. Archived from the original on April 22, 2014. Retrieved February 19, 2013. ^ "NORMALES CLIMATOLÓGICAS 1981–2000" (PDF) (in Spanish). Comision Nacional Del Agua. Archived from the original (PDF) on May 2, 2014. Retrieved February 19, 2013. ^ "CLIMAT summary for 76382: Torreon, Coah. (Mexico) – Section 2: Monthly Normals". CLIMAT monthly weather summaries. Ogimet. Retrieved 20 January 2019. ^ Travel Torreón. "Cristo de las Noas". Archived from the original on 2011-07-17. Retrieved 28 July 2010. ^ [dead link] "Cristo de las Noas". Archived from the original on August 14, 2007. Retrieved 2007-09-17. Wikimedia Commons has media related to Torreón.